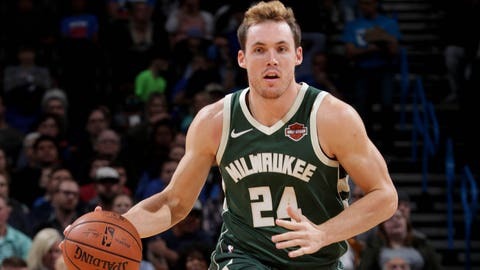 Not many people noticed when the Milwaukee Bucks signed Pat Connaughton to a two-year, $3.3 million contact in August but he’s certainly getting some recognition now. The 6-5 third-year guard out of Notre Dame has been a sparkplug for Milwaukee this season, averaging 6.9 points on 48.1 percent shooting while appearing in 12 of the Bucks’ first 15 games. Milwaukee signed Connaughton to help bolster its 3-point offense. He’s converting 35.7 percent of his attempts, just slightly below his career average of 36.3 percent but has also been a key contributor on the defensive end with eight blocked shots. “For me, it’s about making the winning plays, making the right plays, making the basketball plays and being aggressive whether it’s on defense or offense,” Connaughton said. His effort and production has earned the respect of his teammates, especially star forward Giannis Antetokounmpo. The Bucks will count on Connaughton’s energy off the bench again Friday night when they continue their six-game home stand as the Suns visit Milwaukee. Phoenix will be looking to bounce back after dropping a 124-116 decision to the Bulls on Wednesday night in Chicago. Poor defense plagued the Suns in that loss as they allowed Chicago to shoot at a blistering 56.8 percent clip including 11 for 25 on 3-point attempts. The Suns shot well, too, hitting 49 percent of their shots with 10 3s in 34 attempts but also gave up 22 points off 13 turnovers. Phoenix led by nine points late in the third quarter before things went south quickly. The game marks a chance for Bucks guard Eric Bledsoe to face his former team. Phoenix dealt Bledsoe to Milwaukee last November in exchange for Greg Monroe and second-round picks in 2018 and 2019. Bledsoe averaged 18 points in 224 career games for Phoenix and 24.5 points on 43.6 percent shooting against the Suns after last season’s trade. Milwaukee has won six in a row against the Suns, whose last victory over the Bucks came on Jan. 6, 2015. Middleton scored 75 points in two meetings with Phoenix last season.